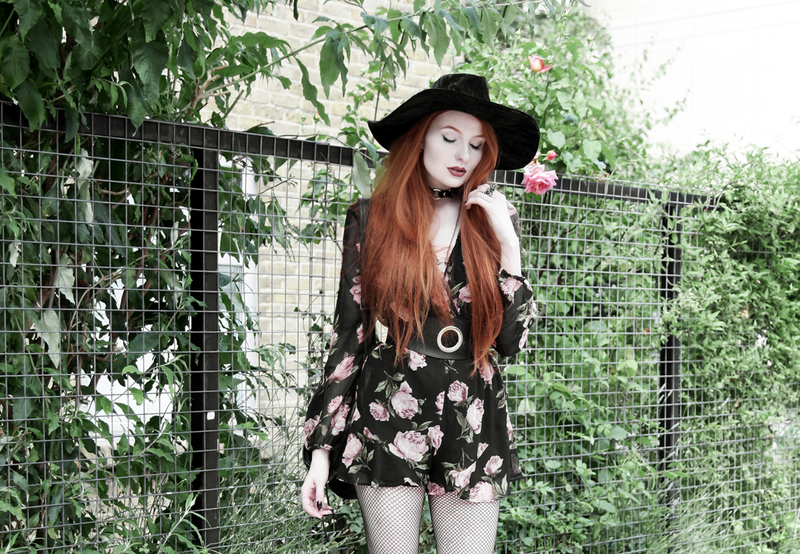 Last Summer Days – Dark Floral Playsuit. We’ve been quite lucky with the summer weather this year – while it hasn’t been as super-bright and sunny as previous years, the warmth has lasted longer into September. (Though to be honest, the lack of direct sun suits me as I burn like a crisp!) This means that I’ve been able to get more life out of my summer wardrobe, including this gorgeous dark floral playsuit. If you have followed me a while you’d know that I adore plants & flowers, so have always wanted to show that through my clothes, but finding the perfect dark floral print is so difficult! In the past, they’ve all been either too bright, too busy, or just too boring. So when I saw this playsuit on Asos (in the sale, no less!) I jumped at it. The black background with the washed-out, dusky peonies strikes the perfect balance that I’ve been looking for. For its first outing, I paired my lovely new floral playsuit with my Killstar velvet fedora to add a bit of extra texture, and keep the sun off my face. I also wanted to avoid the florals looking too sweet, so paired it with ‘tougher’ accessories. My Zana Bayne belt is always a good option in these situations – did anyone manage to cop any of her & Other Stories collab before it sold out? The prices were so good, but I’m on a spending ban so missed out big time! I finished off the look with my reliable studded backpack, and some chunky boots. Speaking of summer wardrobes… Jay and I have booked to go to Bali in a couple of months time! We are SO incredibly excited (even if I will be living in SPF 50 under giant hats) – have any of you been before? Do you have any recommendations of things to do? And is there also any content you’d like to see from me relating to the trip? Let me know! Previous Post Mixing High End, High Street & DIY. Your outfit is incredibly beautiful! I love when floral prints and dark shades are mixed together! They all look so mysterious and stunning! Stunning photos Olivia. Love the playsuit!